There were 12 chances to save the life of this eight year old girl. Instead, she died of 128 injuries. How could a child in Britain die like this? 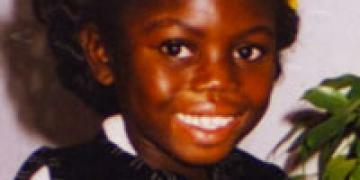 On 25 February 2000, months of abuse and neglect finally overcome Victoria Climbié and she’s declared dead. The torture she’s suffered includes starvation, cigarette burns, repeated beatings with bike chains and belt buckles. And hammer blows to her toes. But the London doctors who declare this little African girl dead believe her name is Anna. Victoria Climbié is born on 2 November 1991 in a small African village called Abobo which is near Abidjan, the former capital of the Ivory Coast. Victoria smiles, sings and dances as naturally as other children walk and talk. (In fact, she speaks both her local language and French, as her country is an ex French colony.) Victoria is definitely the ‘entertainer’ of the family. And her parents Francis Climbié and Berthe Amoissi want the very best for her. But their country is often torn apart by civil war, has endemic poverty, and illiteracy is extremely high amongst women. So when, shortly before Victoria’s seventh birthday, her 42 year old great aunt, Marie-Therese Kouao offers to take their daughter back with her to France, it’s the opportunity of a lifetime. Kouao was somebody they knew well. She was the head of the family at the time. She was a French citizen, apparently, from their perception, incredibly wealthy. One of the analogies is…somebody offering you to send your child to Eton and Harrow and then educate them at Oxbridge. Unknown to them, Marie-Therese only wants Victoria to help her access better state benefits back in France as she believes having a child will prioritise her on things like housing lists. To this end, Marie-Therese has already prepared a false passport in the name of her fictional daughter Anna. But the family of her intended target refused to let their Anna go. And it’s easier for the manipulative Marie-Therese to recruit another child of a different name, than change the passport. So she targets Victoria. To get her through border controls, she gives Victoria hair extensions. She now resembles the photo of Anna, the actual girl in the false passport. Within 18 months, Marie-Therese, along with her new bus driving boyfriend, will be responsible for killing ‘Anna’. Many will blame the Haringey social worker, Lisa Arthurworrey, for not doing more to prevent the abuse. But in reality, she will be just a scapegoat for a system that utterly fails to protect an innocent child.